WEST BERLIN, NJ--(Marketwired - June 18, 2015) - A fleet of amphibious 8-wheeled black-and-yellow vehicles, otherwise known as ARGOs, may be a rare site to see in the United States. Perhaps more rare, would be children and their families operating the all-terrain machines on an off road course. Diggerland USA made this possible while unveiling their 25th attraction, following the World's Fastest Backhoe and JCB WorkMax UTVs that were introduced earlier in the construction theme park's second season. "The ARGO furthers our goal of providing one-of-a-kind entertainment for families visiting our park," said Yan Girlya, co-owner of Diggerland USA. 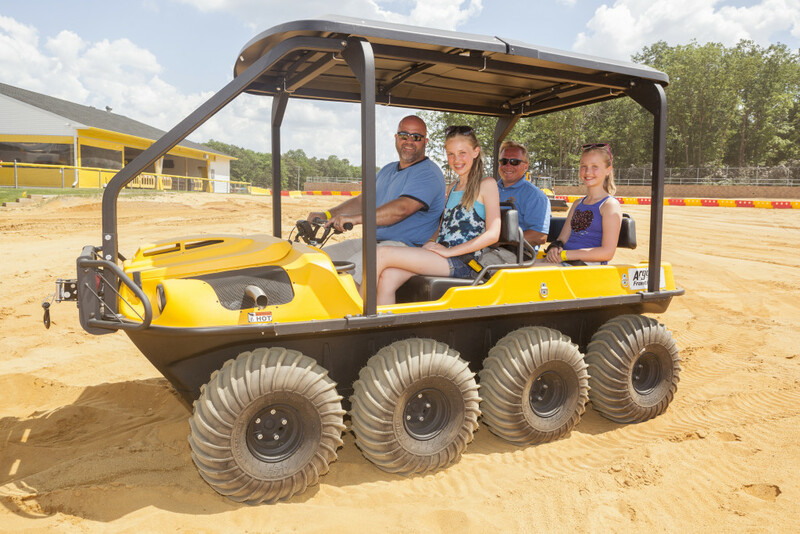 "Diggerland is the only place in America where kids and their families can operate heavy equipment; and now we're the only place you can get behind the controls of an ARGO." Guests can operate the ARGOs as early as Friday, June 19 as Diggerland is now open every day through Labor Day for the summer. The newest attraction seats four people; three guests and an operator and is driven along a fixed course in the park. "We are always looking to add new attractions to our park," said Ilya Girlya, co-owner of Diggerland USA. "We instantly knew the ARGO was a must-have. It's like nothing we've ever seen before and we're very excited to give our guests the chance to drive them." Diggerland will also serve as a vendor for rentals and purchases of ARGOs. For more information on ARGO sales and rentals, visit: UTVMasters.com. Diggerland USA officially re-opened for its second year of operation Sunday, March 15. The construction-themed adventure park covers 14 acres of centrally-located land in Camden County, NJ and offers visitors the opportunity to operate full size excavators, dumper trucks, and backhoes among a range of other heavy machinery in a safe, family-friendly environment. Its US location is based in West Berlin, NJ. More information is available online by visiting the Diggerland USA Press and Media Page. The park currently offers 25 on-site attractions, most of which are comprised of modified JCB heavy construction equipment that has been engineered to allow parents and children to safely dig, drive and ride familiar, real-sized construction equipment. 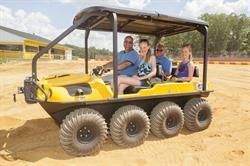 Diggerland's fleet of amphibious, 8-wheeled Argos are the park's newest attraction in 2015. You Go. We Go. Argo!